Commission have arrested two suspected internet fraudsters at their hideouts in Gwarimpa and Life Camp area of the city. 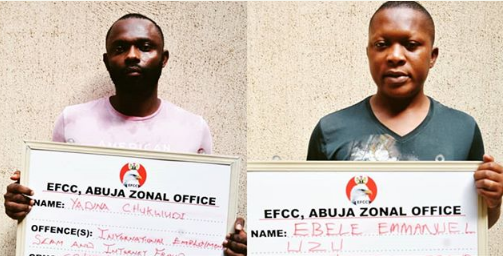 The guys, Ebele Emmanuel and Yadina Chukwudi, were arrested on April 1, 2019 following intelligence report received by the Cyber Crime Section of the zone. Yadina allegedly specialised in job scam, in which he promises his victims fictitious jobs oversees and makes them part with their hard-earned money as processing fees. 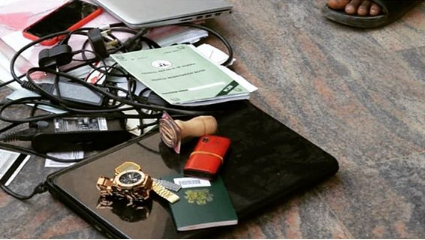 On the other hand, Ebele is alleged to be a member of a syndicate, in which he acts as a “picker”, using a fraudulent account to receive money from different victims on behalf of other internet scammers. He gets his cut and further distributes it into other accounts to avoid being traced. Investigations further revealed that Ebele owns an exotic house in Gwarimpa as well as an Estate in Asaba, Delta state, which are suspected to be proceeds of crime. They will be charged to court as soon as investigation is concluded.